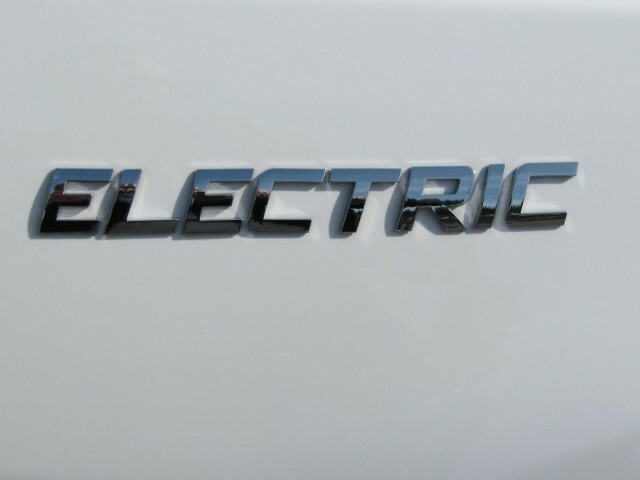 AMP Electric Thinks Soccer Moms Want Electric Equinoxes; Do They? 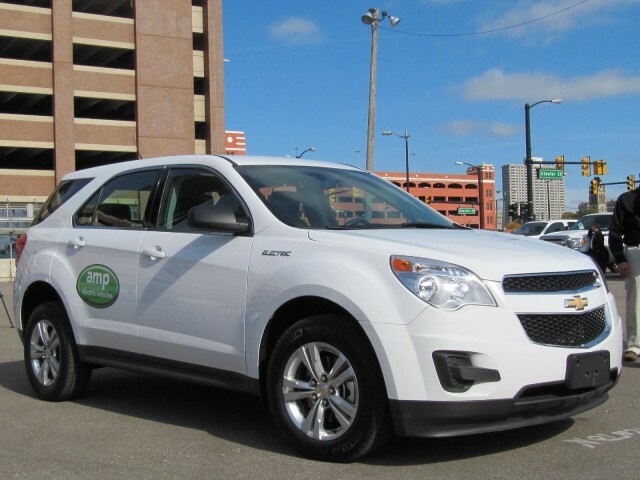 Attending a conference in Detroit a couple of weeks ago, we had the chance to drive a converted "Amp'd Chevrolet Equinox" crossover, offered by AMP Electric Vehicles. Based in Cleveland, the company hopes to sell electric conversions of "best of class" vehicles in several segments to early adopting consumers who are willing to pay for all-electric vehicles. AMP has gotten a fair bit of media attention, including a lot of love from Detroit outlets, so we were eager to chat with executives and curious to understand where they see themselves in the expanding universe of electric-car providers. We also wanted to drive their electric Equinox, which we were able to do on a slalom track set up in a large parking lot next to the Detroit River. Top speeds were about 40 or 45 miles per hour, so we don't have a sense for how it would behave on a freeway. Our overall impression was that the vehicle needs more development work. Other journalists have noticed the same thing, including a number who cited software glitches yet to be resolved. Nonetheless, it's possible that the vehicle may appeal to the small number of families willing to pay roughly $45,000--or double the price of a gasoline Equinox--for a crossover with zero emissions and up to 150 miles of range. In the short term, AMP hopes to sign deals with multiple automakers to buy small numbers of "gliders," or new vehicles built without conventional gasoline powertrains. AMP plans to use them as the basic for electric conversions, which they will sell through selected dealers. The company plans to start production of the AMP'd Equinox later this year, with hopes of selling up to 100 per month. The company chose the Equinox both because crossovers are fully 20 percent of the U.S. vehicles sold, said CEO Steve Burns, and because no automaker appears to be planning an all-electric crossover in the next several years. That's true only if you discount the Toyota RAV4 converted by Tesla to all-electric operation, which Toyota plans to unveil at the 2010 Los Angeles Auto Show in two weeks. Over the next three years, says Burns, AMP would like to offer as many as 10 different vehicle conversions, from multiple carmakers. A second SUV from a different maker is next, he says. Long-term, he envisions building a premium brand positioned around the longer range of AMP's conversions, so that customers will understand that "This vehicle's been AMP'd!" means better performance than any competing electric vehicle in its class. The company has many auto-industry veterans as executives and board members. The latest is James E. Taylor, most recently CEO of HUMMER during its unsuccessfully divestiture by GM and ultimate shutdown. He was also general manager of Cadillac. The converted crossover is powered by a pair of 67-kilowatt electric motor driving the rear wheels, which also provide regenerative braking. They are the same Remy motors used in GM's Two-Mode Hybrid system for full-size SUVs and pickup trucks. Energy is supplied by a battery pack of 37 kilowatt-hours split between locations under the front hood and beneath the rear load deck. The lithium-iron-phosphate cells are sourced in China. AMP says the car will achieve up to 150 miles on a full charge, but quotes a more realistic "real world" and "all season" driving range of 120 miles. The 5-kW onboard charger in the Equinox electric uses a standard J-1772 charging port--the same as the 2011 Nissan Leaf and 2011 Chevy Volt--and accepts both 120-Volt and 240-Volt current. AMP quotes recharging time at 4 to 5 hours at 240 Volts, and 8 to 10 hours using 110-Volt power. We didn't have a chance to test it on the open road, but AMP quotes a 0-to-60-mph time of less than 7 seconds, and a top speed limited to 90 mph. It says the converted car weighs roughly 300 pounds more than the standard Equinox with a 2.4-liter four. The driving experience was adequate, but not particularly refined. Motor noise was always present--a chronic conversion problem once engine and transmission sounds are eliminated--and the regenerative brake blending software nowhere near as smooth as that from experienced hybrid makers like Toyota and Ford. That's not surprising from a small, publicly-traded company without government grants or loans, but we suspect it could turn off the progressive soccer moms who are the target for this vehicle. 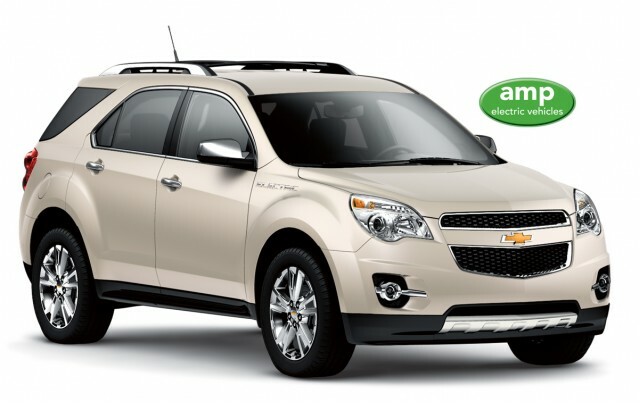 Since it's based on a standard 2011 Chevy crossover, the AMP'd Equinox comes standard with power windows and lock; tilt and telescoping wheel; an AM/FM/XM six-speaker stereo with auxiliary input jack; and one year of Onstar service. Options include power sunroof; backup camera system; leather seats, heated in the front; premium eight-speaker audio system; Bluetooth wireless package and USB connectivity; and other features from the Chevrolet list. CEO Burns said that the original warranty on every part of the vehicle not touched by the conversion "should be honored" by Chevrolet dealers. AMP warranties its battery pack for 8 years / 100,000 miles, and all other electric components for 3 years / 36,000 miles. AMP has also converted a Saturn Sky two-seater sports car to its electric drive system. Being smaller and lighter, that prototype is quicker (0 to 60 mph in just 5.7 seconds), but the company expects the Equinox to have much broader appeal. It may be that if AMP can continue refining its conversion and sign up dealers, and if it has sufficient cash in the bank, it may be able to sell a few dozen or even 100 electric Equinoxes a month. But that number is a drop in the bucket compared to the tens of thousands of electric and plug-in cars that will be sold in the U.S. next year. And those cars will be backed by automakers who have devoted a lot more testing and development to their vehicles than AMP can likely afford--which may reassure the soccer moms who want to go electric to transport their above-average children. If you are bound and determined to have a zero-emissions crossover--and willing to pay $50,000 or so for it--you may soon have two options: the Amp'd Equinox, and the Toyota RAV4 powered by Tesla. Each is a conversion, the base vehicles are both highly rated leaders in their segment, and we look forward to seeing what they're like on the road. But we think AMP is destined to be at most a side player in the coming wave of electrified vehicles. Protean 'Inside-Out' Wheel Motor Design: A Company To Watch?